Recently, on a test SAP system I experienced a problem while processing an order confirmation output which is sent via fax. 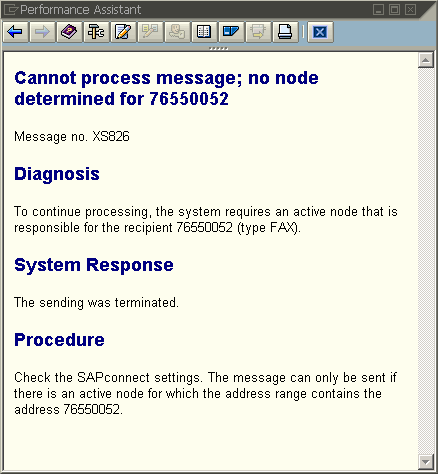 The ABAP error was "Cannot process message; no node determined for 76550052" where the number 76550052 is the fax number. Developers can use SAP transaction code SOADM Business Communication Administration tcode for administering SAP Business Communication Services (BCS Administration). There must be an active node in Settings > Outbound Messages for fax type and with a range covering the fax number causing output processing error. To continue processing, the system requires an active node that is responsible for the recipient 76550052 (type FAX). Check the SAPconnect settings. The message can only be sent if there is an active node for which the address range contains the address 76550052.